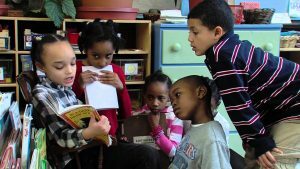 Allowing the students, teachers, and alumni to tell the story, Good Morning Mission Hill is an hour spent at Boston’s K-8 public progressive Mission Hill School. Producers/directors Tom and Amy Valens paint a beautiful, inspiring picture of how human, how compassionate, how much fun, and how effective progressive education can be. This urban school’s teachers have more autonomy in what and how they teach. The results are dramatic, pointing a way to quantum leaps in the effectiveness of public education in the United States. My jaw dropped, and my heart soared when I learned that a few students serve on the school’s governance board, and have equal decision-making participation. Valens’ documentary is based on their internet series, “A Year at Mission Hill” which is included in the film’s DVD. Good Morning Mission Hill is Valens’ follow-up to their 2011 equally-inspiring documentary From August to June which covers a year in the life of a progressive rural school.